As you may have noticed, we have lost 39 minutes of sunlight since I last posted the weather on 1 November. There have been some beautifully sunny days this last week, with scattered rainy days in between. The humidity is always high. Even on drier days, the humidity is still around 80% or higher. This makes cold feel colder. The temperatures have dropped in the last week. This morning we woke to a beautiful white world. 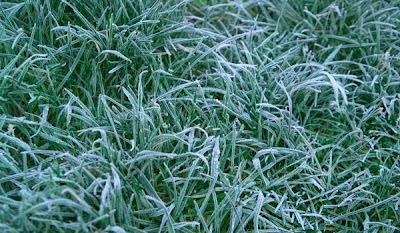 No, it had not snowed, there was a very thick layer of frost covering everything. And if the frost was hidden in shadow, it never got warm enough to melt without the direct sunlight. The kids ask me every afternoon, "Why is it so dark?" Our countdown to Winter Solstice has begun.